A quiet country road leads you to the fresh and simple world of Richmond Blueberries and this Ward White Cedar Log Home with a soaring field stone rumford fireplace, separate wood-stove hearth, updated kitchen with cherry cabinets and granite counter tops, all on 32 acres. Own both sides of the road with over 2500 blueberry bushes with an established blueberry operation, 32×44 post and beam construction barn, 2 car garage and additional 12×12 barn and an opportunity to run your own side business or just enjoy what the land has to offer all for $379,000. Or purchase the log home, 2 car garage, 12×12 barn and 800 blueberry bushes on 25 acres separately for $248,000. Or purchase the 32×44 barn, drilled well with 6 acres (2 separate 3.2 acre building lots) and over 1700 blueberry bushes separately for $139,000 and build your dream home. The options are many and the choice is yours! 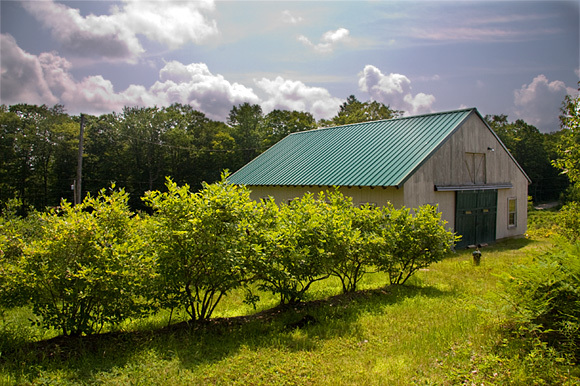 The barn on top of the property’s blueberry hill.